Elizabeth Jane's Nameboard - clicking on the image will download a 4.7 megapixel greatly detailed image of the nameboard. In 2003 a ceiling was removed in a cottage at Robin Hood's Bay and two timbers were found, one with 'Ipswich' carved in it and the other 'Elizabeth Jan'. They were later found to be the port of registration board and name-board of a Canadian brig called the Elizabeth Jane built at Guysborough Nova Scotia in 1817. In 1819 she was sold at Hamburg to John Cutler Ramsden who registered her at Hull, then an important whaling port. By 1821 she was registered at London, and in 1823 sailed to Sierra Leone. 1827 found her registered at Stockton on Tees, and from 1830 at Ipswich. In 1830 she was owned by Francis Hammond a London staymaker, a father and son both called Enos Page, and William Read. Read and the younger Page were in partnership as ship builders from 1834. In 1844 Read was charged with deliberately sinking the Collina. Read was found not guilty, but William Simpson her master, aged 28, was convicted of deliberately sinking the ship and sentenced to be transported for life. From 1846 William Read was the sole owner of the Elizabeth Jane. The mystery of how she came to be in a cottage at Robin Hood's Bay has only recently been solved. The voyages she made and who sailed in her are gradually coming to light. So too is the story of the opportunistic house owner who was able to add two floors to his house when the Elizabeth Jane drifted ashore. 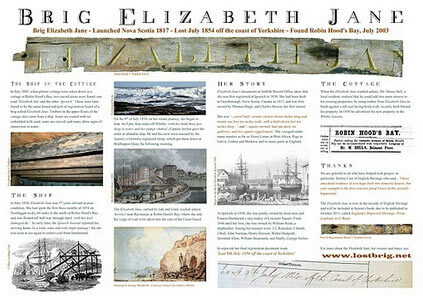 The recent on-line publication of 19th Century newspapers has helped fill in some parts of the Elizabeth Jane's story. We now know that after spending the early months of 1854 on rocks at Newbiggin on Sea she returned to Ipswich in a 'leaky state'. However, she was soon at sea to collect coal from Sunderland. On July 8th 1854, on her return journey to Ipswich, she sprang a leak four miles off Whitby and was abandoned off Robin Hood's Bay. Captain Archer and his crew were rescued by a Grimsby vessel called the Samuel and were set down at Bridlington Quay. Had the Elizabeth Jane been deliberately sunk, like the Collina? This website is an ongoing attempt to investigate and record Elizabeth Jane's Story, her voyages, and the lives of those who sailed in her. If this site is new to you, please look at: 'News' and 'Timelines'.